One Sunday morning in May 1980, Mount St Helens, one of the snow-covered peaks of the Cascades Mountains, erupted, causing a massive landslide, devastating a vast area of forest and killing 57 people. The volcano continued erupting intermittently for six years, but has not erupted again since. 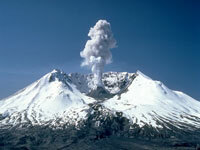 Today the area, lying about 168 miles (271km) south of Seattle, is being preserved as the Mount St Helens National Volcanic Monument, being left to revive naturally, while scientists continue to monitor the volcano and the environment of the surrounding landscape, providing them with much valuable information regarding volcanoes and ecosystems. The Monument has become a fascinating tourist attraction equipped with numerous viewpoints and miles of trails enabling it to be explored by car or on foot. Forest Interpreters host visitors during the summer months, organising activities like walks and amphitheatre presentations, while in winter the mountain slopes provide cross-country ski and snowmobile trails. Climbers take on the journey to the crater rim and five visitor centres operate on State Road 504 on the west side of the mountain providing information about the volcano and the environment. A gift shop at the Hoffstadt Bluffs Visitor Center offers hand-crafted items made from Mount St. Helens ash. Admission: Depending on what sites one plans to visit, there is a Regional Northwest Forest Pass ($5 per vehicle).